"The Histories of New York City's Parks," Journal of Planning History 16.2 (Spring 2017): 95-97. 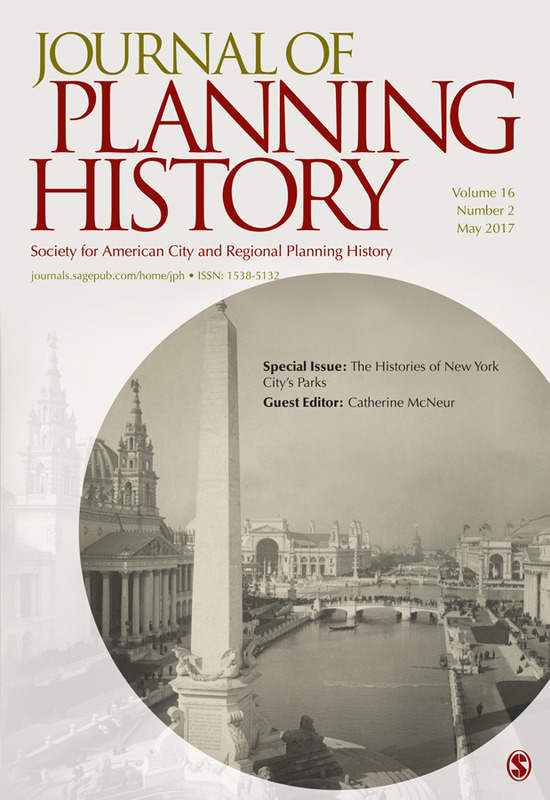 "Parks, People, and Property Values: The Changing Role of Green Spaces in Antebellum Manhattan," Journal of Planning History 16.2 (Spring 2017): 98-111. "Rooted in History: Portland's Heritage Trees," in University-Community Partnerships, ed. B.D. Wortham-Galvin, Jennifer Allen, and Jacob D. B. Sherman (Greenleaf Press, 2016): 89-98. “The ‘Swinish Multitude’: Controversies over Hogs in Antebellum New York City,” Journal of Urban History 37.5 (September 2011): 639-660. “Hogs,” in The Encyclopedia of New York City (ed. Kenneth T. Jackson), 2nd edition. New Haven: Yale University Press, 2010.
Review Essay: “A Time to Reap: Environmental History in the Early Republic,” Journal of the Early Republic 38.1 (Spring 2018): 149-155.
Review of Food and the City: Histories of Culture and Cultivation, by Dorotheé Imbert, Buildings and Landscapes 24.2 (Fall 2017): 120-122.
Review of Gowanus: Brooklyn’s Curious Canal, by Joseph Alexiou, American Historical Review (December 2016) 121 (5): 1704-1705.
Review of Success Depends on the Animals: Emigrants, Livestock, and Wild Animals on the Overland Trails, 1840-1869, by Diana L. Ahmad, Oregon Historical Quarterly 117.3 (Fall 2016): 487-488. Response to Roundtable on Taming Manhattan, H-Environment Roundtable Reviews 6.13 (24 February 2016). Review of Urban Appetites: Food and Culture in Nineteenth-Century New York, by Cindy Lobel, Agricultural History 90.1 (Winter 2016): 148-149.
Review of Preserving South Street Seaport: The Dream and Reality of a New York Urban Renewal District, by James M. Lindgren, Journal of American History 102.1 (June 2015). Review of Beyond Nature’s Housekeepers: American Women in Environmental History, by Nancy C. Unger, Pacific Historical Review 83.1 (February 2014): 145-146.
Review of Precious Commodity: Providing Water for America’s Cities, by Martin V. Melosi, Planning Perspectives 27.4 (October 2012). Review of the exhibit Skin and Bones: Tattoos in the Life of the American Sailor at the Mystic Seaport Museum, Common-place 12.1 (October 2011): http://www.common-place.org/vol-12/no-01/. Review of Building Power: Architecture and Surveillance in Victorian America, by Anna Vemer Andrzejewski, Louisiana History 51 (Summer 2010): 375-377.
Review of 194X: Architecture, Planning, and Consumer Culture on the American Home Front, by Andrew M. Shanken, Enterprise and Society 11.2 (June 2010): 425-427. "The Tree that Still Grows in Brooklyn, and Almost Everywhere Else," Gotham: A Blog for Scholars of New York City, January 4, 2018. "One of the First Gentrification Movements -- The Great Piggery War," The New York Post, February 1, 2015. "Protecting their Pigs: Women and Urban Agriculture in Antebellum Manhattan," Render: Feminist Food and Culture Quarterly Blog, July 28, 2014. “The Shantytown: Nineteenth-Century Manhattan’s ‘Straggling Suburbs,’” From the Stacks: The New-York Historical Society Library Blog, June 5, 2013.